Are the Biblical commandments really divinely given laws? Is it possible that they are actually arbitrary restrictions that hinder human freedom, or merely moral "signposts" and not to be taken literally? How relevant are the 10 commandments? In the inspiring and thought-provoking new series, The Ten Commandments, renowned author, psychologist and Franciscan priest, Fr. Benedict Groeschel explores the Decalogue with great sensitivity and insight. Originally broadcast in twelve episodes on Mother Angelica's Eternal Word Television Network, and available now on six CDs, this thoughtful presentation is not an attempt at an exhaustive analysis of the commandments, but rather a series of fruitful meditations and practical applications of the 10 Commandments to your life today. As you listen, you'll discover why all who take morality seriously must believe in objective moral norms. Father reveals how the moral law is written on the human heart and how, although they may no longer be "politically correct", the Ten Commandments form the moral foundation of the great world religions and western civilization itself. A renowned retreat master, Fr. Groeschel has the ability to be compassionate without compromising the truth. Prepare to be called to a profound examination of conscience as he grapples with the tough moral issues facing our society and takes a no-holds-barred account of the state of the American soul. You'll gain new appreciation of the depth and scope of a seemingly simple divine directive like, "Honor thy father and thy mother" when seen in terms of the decimation of marriage, family life and the holocaust of abortion. One after another, Fr. Benedict dispels the many myths and misconceptions of morality promoted by modern psychology, the media, the universities and, sadly, even religious leaders. Also, you'll want to have your Bible in hand as Father explores the teachings of both the Old and New Testaments, especially how Our Lord Himself supports, validates and requires the observance of the Ten Commandments. Order The Ten Commandments today and gain a greater appreciation of the relevance of this crucial, objective moral standard and rediscover how these ten divinely given laws, too often dismissed as impossible for human frailty to sustain, truly hold the key to bringing the civilization of love to the land that God has given us. Why it's not enough simply to "go to church"
Why we all need "a day off"
For sheer pageantry and spectacle, few films can equal its splendor. It tells the story of Moses (Charlton Heston), once favored by the Pharaoh©‡s (Yul Brynner) house, who turned his back on a privileged life and responded to God©‡s call to lead his people to freedom. Filmed in Egypt and the Sinai with one of the biggest sets ever constructed for a motion picture. The Ten Commandments — "What They Mean" "Why They Matter" "Why You Should Care" Hosted by Adrian Snell -- composer, singer, and communicator. There is Nothing Like It! What even comes close? Here is an historic document over 3,000 years old. It is a code for living more influential than any other. It confronts us today as an object of unceasing and intense public debate. The Ten Commandments were given to the people of Israel, yet they have been embraced by diverse cultures over long centuries. The neglect of the Ten Commandments is seen by many as contributing to a moral breakdown today. Others fight to keep them out of public places. Can you think of any other ancient text that so inspires such contemporary attention? WARNING: The contents of these programs will expose you to the real reasons why the ancient decalogue is so feared by many moderns and why these words are regarded as so dangerous that judges have ordered their removal from courtroom and classroom walls. We caution you that use of these materials can permanently affect your whole understanding and outlook on life. Use these materials with full discretion and only if you are willing to take full responsibility for what you may be in for. -Leaders Guide (for the first three programs) - includes a short history of each commandment, quotes, questions, Scripture verses, and scripts. -Student Workbook (for the first three programs) - includes warm-up and introduction, questions for reflection, quizzes and more. Also available are a 112-page leader's guide and a 48-page student workbook. To download sample sessions from these guides, click on the links above. 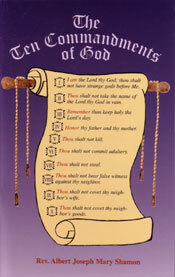 A fresh look at the Ten Commandments (taken up in reverse order) and what they mean for us today. J. John exposes three specific areas of lying: gossip, slander and flattery. J. John looks at God's parameters for relationships and explains how sexual guilt can be forgiven-so long as we change our ways. J. John explains that through a process of managing anger by understanding it, anger can be disarmed-before it is too late! J. John explains how really to honor your parents-by respecting them, by accepting and appreciating them, by affirming and not abandoning them. J. John explains the crucial place of “Sabbath rest” in our fast-forward, work-mad culture. J. John explains how idolatry occurs when we hold any value, idea or activity higher than God. J. John explains how, and he shows that God is most glorified when we are most satisfied-in him.